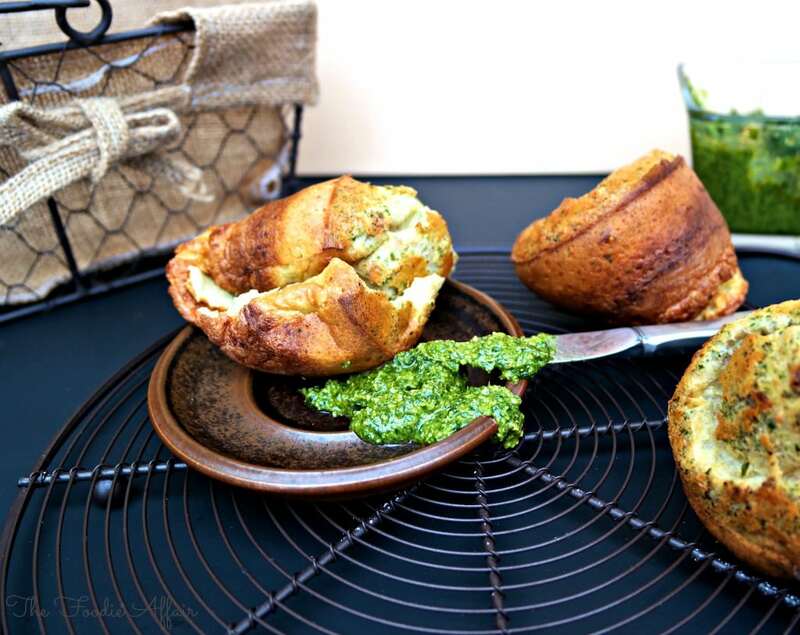 These delicate light and airy Pesto and Parmesan Popovers are bursting with flavor! I’m a little giddy about my new popover pan. Isn’t it the coolest muffin tin ever?! I love it and I got it at a consignment shop for a steal! Near my office there is an old shop that I like to browse through during my lunch hour. It’s a place were a lot of antique dealers consign furniture, jewelry, and tons of kitchen ware, mostly china and crystal. It’s just so fun to poke around and I occasionally find something fun. This popover pan was is not an antique. It’s made by Wilton and it looked new and in perfect condition! The pan was definitely out of place and needed a new home, and for $1.50 it was mine! I’ve made popovers for “The Bomb” Potpie recipe using a muffin pan and they tasted yummy, but each roll certainly didn’t get the blast of heat that a real popover pan is able provide since the cups are separated. I added some of my Basil Pesto with Walnuts along with parmesan cheese to my basic recipe and boy did that liven up these rolls! They’re delicious! These accompanied a variety of appetizers that we ate before going to an outdoor concert to see The Beach Boys last weekend. Are you convinced that YOU could also use a popover pan? For more inspiration go take a look at these awesome Poblano Pepper and Pepperjack Popovers at Erica’s Recipes! Preheat oven to 450 degrees. Put rack on the lowest shelf. 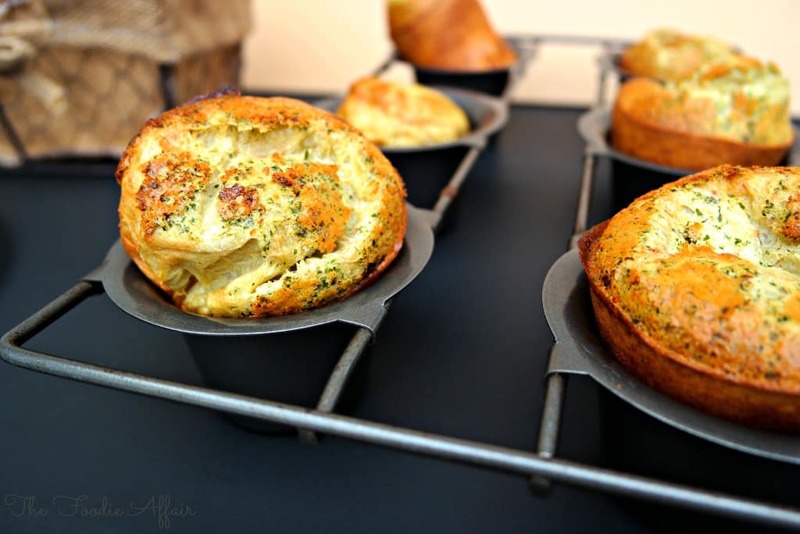 Generously grease a popover or muffin pan. Blend eggs, milk in a blender util smooth. Add flour and blend until there are no lumps. Stir in parmesan and pesto. Put pan in hot oven for 2 minutes. Remove pan and pour batter into each cup about 1/2 full. Bake for 20 minutes. Don't be tempted to open the door! Reduce heat to 350 degrees and bake another 10-15 minutes or until lightly browned. This recipe is adapted from my The Bomb Potpie recipe. Beautiful Sandra! Oh my gosh I want one so badly! Right now, with lots of butter 🙂 Popovers are one of my absolute FAVES – and now looking at yours, I want to make them again like now. Awesome recipe! Thanks, Erica! Such a simple recipe for all that delicious flavor, right! I’m going to be trying yours this weekend! Popovers aren’t very popular, but they are so tasty and light! Thanks so much, Bam! these popovers look gorgeous. I don’t have a traditional popover pan but looking at these, I might consider it now. 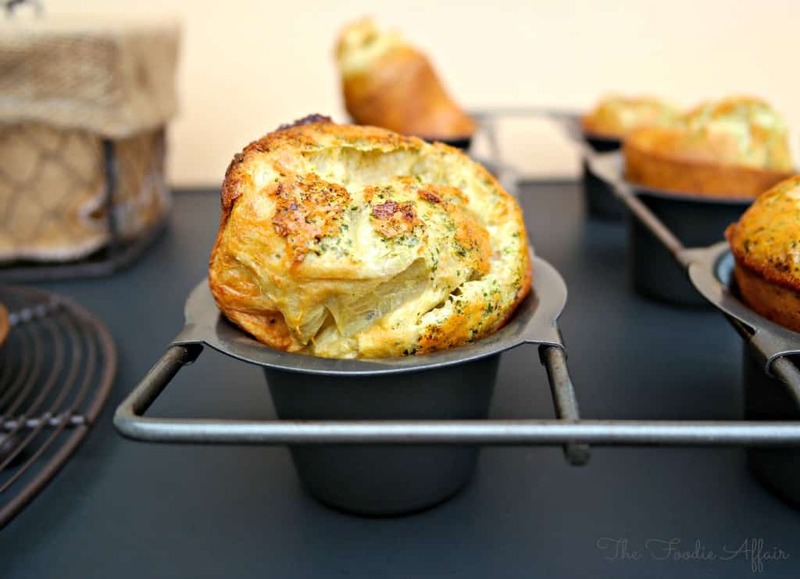 Pesto and Parmesan Popovers sound amazing, and I love the concept of how they are made. I definity can not wait to try these out. I’ve never made popovers before but these look beautiful! What a great deal on that pan! wow! and you put it to good use too! Your Pesto and Parmesan Popovers look so warm and inviting. Love the green of your pesto. This is a spot hitter for sure! Thanks Sandra! 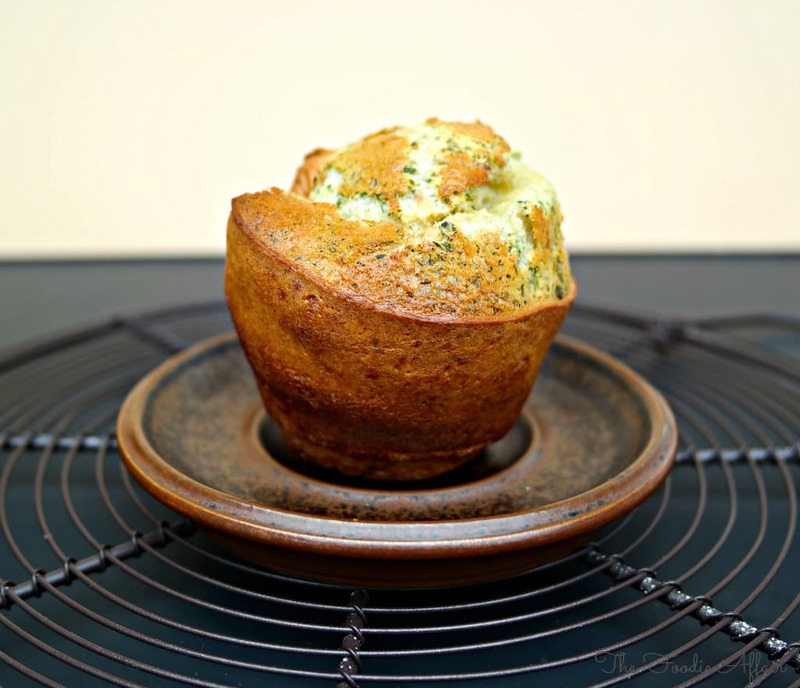 Pesto and Parmesan Popovers sound so delicious! 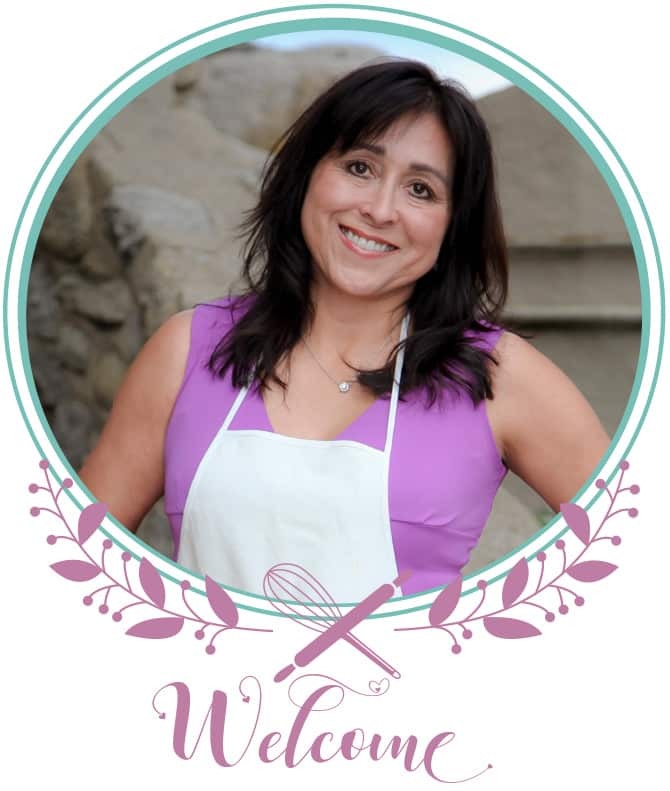 Love that they are only 5 ingredients! G’day! Love the combination of your popovers! YUM! I have everything to make these and time on my hands! That’s so nice for you to pin. Thank you! You can’t go wrong with pesto and cheese! You’ve inspired me! I’m going to dig that virgin popover pan out of the closet and try these out. 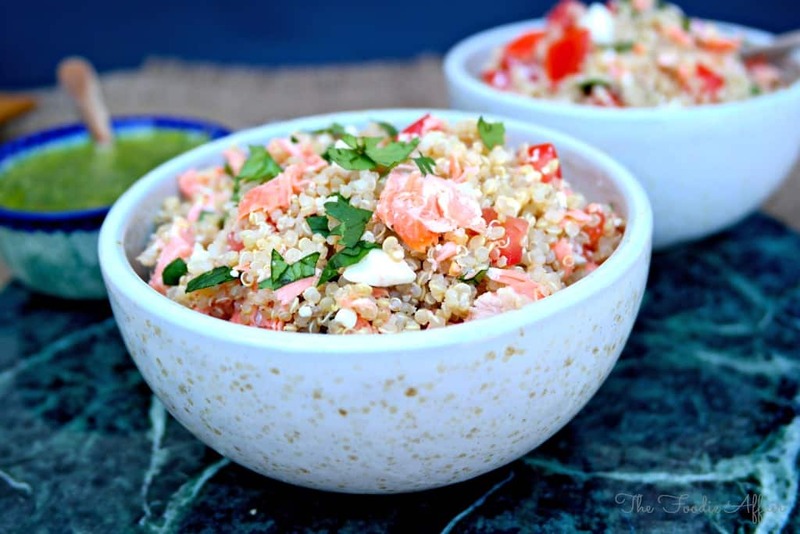 Wonderful photos – great recipe! Super! Yes, dust that pan off! Thanks for stopping by Lorinda! Your Popovers + a glass of wine sound delightful right now.